Operating around the Gili Islands and covering popular areas belonging to Indonesia, Gili Getaway has become one of the pivotal transport links in the region. 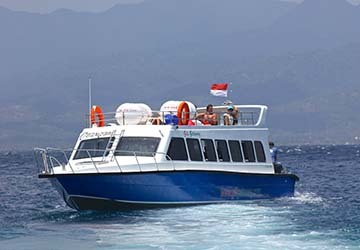 Making regular connections to Bali, the company has propelled itself into one of the most reliable and commonly used ferry operators in Indonesia. The company supplies vessels with a capacity of 40 people, and boasting high powered 250hp engines, most crossings are at least 45 minutes quicker than their competitors. If the high speed crossings are the crux of Gili Getaway, the hallmark is the direct crossing on the route between Bali and Gili Trawangan, with two daily trips lasting around two hours. If that wasn’t enough to elevate the company above its peers, complimentary transfers to and from your resort are provided from many of the ports. Whilst on board, the facilities make for a relaxing sailing; refreshments are readily available, chilled towels and sun block cream are on offer and a sun lounge on the roof caters for those longing to bask in the serene surroundings whilst traversing across the crisp blue water. With directferries.co.uk you can find Gili Getaway timetables, fares and book Gili Getaway ferry tickets. Where applicable we’ll also compare Gili Getaway with alternative ferry companies.